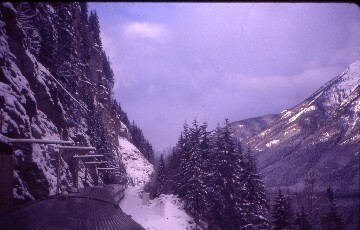 Following the completion of my 1999 North American Rail Pass and the reclaiming of Canada for my sobriety, I started to plan my first true winter rail trip. With the memories of the Northern Lights that were seen over Saskatchewan still strong in my mind, I wanted another chance to see them in their full glory. It would also be my chance to see how people live and survive in the -0 degree C temperatures of Manitoba. This would also give me a chance to finish up all the Western Canada Via Routes (except Vancouver Island). Finally, it would give me the chance to reclaim the BC Rail for my sobriety after my three drink trip during Expo 86 in Vancouver. If the trip ran right, I would end the century with the passing of 500,000 rail miles passed somewhere on the Coast Starlight coming home. In the United States a trip to AAA usually takes care of the hotels but for Canada I had to call the Provincial Tourism Boards to get the information I needed sent to me. Armed with a phone card, I then called each of the hotels that I would be staying at. To get to Canada, I redeemed some of my Alaskan Airline Rail Miles for round trips on the Starlight and the Talgo to Vancouver. 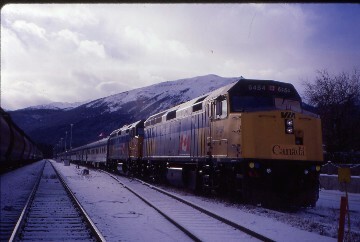 A Canrail Pass from Via took care of all the rest except for BC Rail which required a separate call. With everything in place, I just lived my life and worked hard. I rode my San Diegan trains daily and coached the McFadden JV Boys Basketball Team to a record of 5-2, the best boys record of my coaching career. I dieted and power walked, losing 27 pounds. I had to borrow a camera at the last minute when mine wasn't returned from the shop. The days passed and I packed for my first Christmas away from home and for the unique winter wonderland of snow and ice of Canada. My eyes where wide open and I was fully awake when Train 769 pulled into Santa Ana with Marisol the conductor greeting me at the door. It seems like she's always the conductor when I start a long trip. I took a seat in a California Car and after my ticket was lifted, I visited with Cynthia in the cafe car before taking a cup of tea back to my seat. I listened to Jethro Tull's Underwraps to Los Angeles where there was a Union Pacific Business Train on Track 12. They brought us in on Track 8, so with the Coast Starlight sitting on Track 10, I had to do the drop into the station tunnel then up the ramp where I was almost run over by a Red Cap and his cart. I boarded the Starlight and sat back to enjoy the ride. We waited for the Sunset Limited to arrive and left Los Angeles thirty-five minute late. At Glendale, Mike Norton boarded the train going to the Bay Area so he joined me in the Parlour Car. Larry was our Parlour Car Attendant and he is always excellent. I sat at a table enjoying the view and after Ventura I saw dolphins surfing the waves. We enjoyed a nice lunch and with me battling a cold, I went to the room and took a little nap. It always amazes me what a short nap can do to recharge my batteries. I returned to the Parlor Car short of Point Conception and enjoyed the views to Casmalia where I returned to my room. At San Luis Obispo, Mike and I detrained for some fresh air on a very chilly Southern California Day. Once on the move again, we enjoyed the climb over Cuesta Grade and at Paso Robles I had a nice talk with Larry. After the Starlight trek down the Salinas Valley, I had a New York Strip Steak and a Turtle for dessert. I returned to the theater in the Parlour Car and watched "Bowfinger" laughing my head off. Mike found me before he got off in Oakland and I spent the rest of the evening watching "Runaway Bride" which ended right at Midnight so with the train stopped at Martinez I called it a night. 12/10/1999 I woke up the next morning north of the Cantara Loop with low clouds hiding the views of Mt Shasta. The Parlour Car's nice comfortable chairs were the spot to watch the scenery pass by of Northern California and Southern Oregon. I detrained at Klamath Falls on a very cold morning to two passengers smoking marijuana right on the platform. One word "Stupid!" Leaving K-Falls an hour and a half late, I returned to my room to listen to some music all the way to Chemult where I went to the Parlour Car for a better view of our crossing of Cascade Summit. The landscape is very dramatic and a fore bearer of what is to come in Canada. I went downstairs and watched all of "Bowfinger" before detraining for fresh air at Eugene. I watched Larry do the wine tasting in the Parlour Car and at Portland, Santa Claus was in the station. We departed Portland a mere thirty minutes late and crossed the Columbia River into Washington. Last night's dinner was so good, I repeated again with an equal result. I have never had a bad meal on the Starlight. I watched the end of "Bowfinger" again before I returned to my room for some music. At Tacoma, I thanked Larry for everything he did for me on this trip and when we arrived in Seattle on time, we had to pull past the station due to all the construction for the Sounder Commuter Service which would be started in the future. I walked the five blocks to the Hotel Panama which did not have my reservation or room for me. The night man with the keys would not be there until ten so the on duty man sent me to four neighboring hotels, none of which had any rooms. I returned and called the Pioneer Square Hotel but they had no rooms so I just waited it out. Just then the owner called and after I talked with her she came down and I had a room with a view on the top floor. I took a shower and tried the TV which got one channel with a horrible picture before I tried going to sleep, vowing never to stay here again. 12/11/1999 The next morning, I walked through a slight rain storm back to King Street Station formulating a plan to stay somewhere else on my return through Seattle. The Six Avenue Inn would not take the time to make a reservation for me but in the Seattle Coupon Book I found the number of the King's Inn who took care of me. The Hotel Panama was a one time bad deal. Feeling a lot better, I received my Talgo seat assignment in what was a very busy King Street Station with a Portland Talgo, our Talgo to Vancouver and a Snow Train to Wenatchee which followed us out of Seattle by fifteen minutes all preparing to leave. With the Snow Train out in front of the station, we had to walk out in the rain to our Talgo south of the station on a stub end track. When we departed, we backed south of the King Dome before we pulled forward past the station into the tunnel directly under downtown Seattle. Emerging along the waterfront on a very rainy and dreary morning we made our way through BNSF's Interbay Yard and across the Ballard Locks. Along the Puget Sound the wind was created very large waves that crashed onto the rocks along the right away. At both Edmonds and Everett there were large crowds waiting to board the Snow Train. This trips movie was "Tea with Mussolini" which passed the time nicely into Canada and almost to New Westminster. The weather had improved and the sun was shining as we neared Vancouver where it was announced that the Skytrain was on strike which caused a change of my layover plans. Since I had gone down to San Diego the night before the trip, I had now ridden the entire West Coast operations of Amtrak once more on this trip. Getting money out of the ATM in the station amazed all the people who could not before I did. I bought stamps for the post cards I would send later in the trip before I put my bags in day storage with VIA. I walked through the former Expo 86 site which brought back many special memories to the GM Palace and picked up a Canuck schedule. I continued my stroll along False Creek to the former Drake Street Roundhouse and the Canadian Pacific steam locomotive 364, a 4-4-0. The engine is inside protected from the elements and looks fantastic. I enjoyed my walk back over to Science World on this bright sunny day with a strong west wind keeping it cool. I took in two IMAX movies: "The Mysteries of Egypt" and "Olympic Glory". I learned a lot from the first film and the second one bought back many memories. Back to the Central Station where I bought a phone card, called home and retrieved my luggage to wait for my next train of the trip. While I waited first in line to board the eastbound Canadian, any movement that I made opened the automatic doors to the platforms much to the amusement of the other passengers who formed a line behind me to wait. It was a case of a man screwing up a machine instead of the usual machine screwing the man. We truly do live in a machine's world. After all the Silver and Blue passengers were loaded abroad, I led the way to the coaches and picked out the seat that I wanted, a right hand full window seat. I stowed my luggage overhead and walked back to the Skyline Dome Car for a farewell to Vancouver ginger ale. The Canadian pulled out right on time and I was on my way to Winnipeg. We arrived at Port Coquitlam early and had an extended wait for departure time. Blankets and pillows were then passed out to all coach passengers and since I was tired from an exciting day, I called it an early evening so I could be up early for the Canadian Rockies in the morning. I woke up as the Canadian passed through Vavenly, BC and walked back two cars to the Dining Car for a breakfast of pancakes, sausage, grapefruit juice and tea. Since this is an off season Canadian, all passengers can use the diner while the Skyline Car is just a snack car with Jennifer being the attendant on this trip. It was really a joy for me to be able to eat my meals in the Canadian's fine dining car. Fed and satisfied, I changed my clothes and headed to the Skyline's Dome for a morning of viewing and photography with my mother's camera that she let me borrow for the trip. The clouds hide the mountain peaks along the route until near Blue River where the clouds lifted and things improved. The Skyline Dome was a very social place with me meeting people who had been both to Lynn Lake and Churchill. They were all amazed that someone from balmy Southern California would go there in there in the dead of winter. When I was asked why, I responded with "Never been there before!" and everyone was satisfied. It is always interesting to meet people, hear their stories and find out where they are going and why. At Blue River we again waited on time before traveling the beautiful Albreda Subdivision of the Canadian National to Jasper, AL. I shot many pictures out of the rear of the Dome for the opposite views of my August westbound trip. 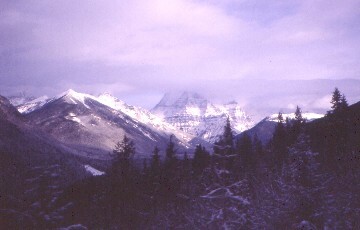 The winter landscape was just breath taking and if Mt Robson would have been clear it would have been perfect. Its top was hidden so it is true, you can not always get what you want. Still some mountain is better than no mountain. Crossing Yellowhead Pass other than the snow, the only thing different from my August trip was that Moose Lake did not have its turquoise color instead being a dark black as the sun tried to break through and did not succeed until we arrived in Jasper, thirty minutes early. Via turned the passengers loose on the town and almost everyone got off to explore Jasper while a cleaning crew made the train spotless again. VIA takes so much pride in their operations that is just one of the reasons that I love their service. I photographed the train and CN 4015, a 4-8-2 steam engine on display. I found a camera shop for future needs, the hotel for my return stopover through here, a KFC for lunch and a market for cookies for the Lynn Lake segment. Be prepared is a motto left over from my Boy Scout days. I returned to the train to eat lunch before writing down my continuing adventures of this trip. 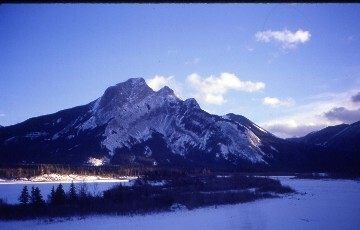 Leaving Jasper on time, I photographed from the front seat of the Dome as I listened to Bad Company. The day turned out to be prefect with the sun out brightly and the top of the peaks clear. At the east end of the yard, the city puts out food for the local Elk population and many of the creatures were watching the Canadian leave town. A few minutes later, a pair of Big Horn Sheep were standing on the rocks on the south side of the train paying tribute to the Canadian by posing perfectly. With the mountains in the ever changing views, I took time to thank God for my continuing sobriety on his great Earth. I feel so thankful for just being able to experience all of this and for the fact that I am still alive. Nature was one of the greatest gifts that God gave to this world after of course Jesus Christ. This is truly God's County. We waited at Devona for our sister westbound train for fifteen minutes before we caught up to an eastbound CN freight that we could not get around until Swan's Landing. We left the mountains behind and headed down into the foothills to Hinton, AL where I returned to my seat for a listen of Rod Stewart Live and a reading of Michael Crichton's Timeline, this trips book. I read for over an hour before returning to the Dining Car for an excellent Roast Beef Dinner. Since I do not like either soup or salad, they gave me a glass of grapefruit juice and two rolls. I had chocolate milk with my meal and for dessert, a delicious piece of chocolate cake along with tea. VIA runs such a passenger friendly dining car where passengers are not rushed and a relax atmosphere prevails. When the Canadian arrived in Edmonton, I stayed abroad for a change as there is little to do in the station and besides it was nice and warm here inside the train. The Canadian left Edmonton and while the train sped east, I listened to Deep Purple Live prior to calling it a night or so I thought. It always amazes me that after the lights are turned out why people keep talking in loud voices? The woman across from me gets into everyone's conversation and her husband stands directly above arguing with her to be quiet. This shows the true advantage of having a sleeper or at least having a set of ear plugs. Soon, although it takes a lot longer than normal the car settles down and only the sound of the rails are heard. That was until about twenty five miles west of Viking, SA when ballast started to hit the under carriage of the car. People started screaming that we had derailed and I calmed them all down by saying we did not. First, we were still had head end power and secondly we were still on the rails. The coach ahead of us and the Skyline were still in line. Plus there was not any violent rocking motion of our car. Next there had been a bang like we had hit something like a shopping cart but not out here in the middle of nowhere. I told the passengers that the head end power would be off while the crew inspected the underside of the train. So I told them that since there was not anything that we could do about the situation, that we might as well all go back to sleep. The girl behind me spotted a meteor shower in progress so I took advantage of it watching the best meteor shower of my life with a great number of fireballs seen. It was quite a show. That was not the only show going on. A woman started telling a story of a Canadian that had hit a car east of Viking and after hearing her tell this five times, I opted for my Walkman to drown her out. The meteor shower helped pass the time nicely and after a forty minute delay we headed east into the night. The next morning I learned that the train had hit a clump of ice on a grade crossing and it bounced its way under the train. It raised the ballast before breaking an air hose back in the sleeping car section of the train. What a night! The only thing that could have made it better would have been a show of the Northern Lights but alas, no performance took place. 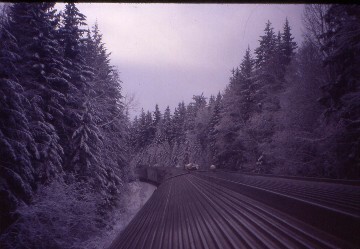 12/14/1999 I slept late and went to the Dining Car for a repeat of yesterday's pancakes but this time with bacon. As we traveled east across Manitoba it was funny how much this reminds me of Montana. The sky is switching off between clear and mid level clouds. At this point of the trip, I am just killing time until tonight's new route by reading and listening to music. At Rivers they allowed me to detrain for a quick picture since we were early again. It was ice cold and windy so the warmth of the train felt so very good when I quickly returned inside. 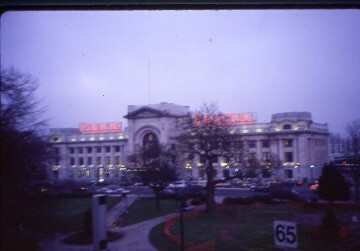 We pulled into Winnipeg on time and I started my nine hour wait for my next train. Since photography was not allowed on the platform, I had to walk around the building and outside to find a suitable location for a picture of the train. I climbed up an embankment and was rewarded with a great view of the train. With that done I decided to find my hotel that I would be using on my return visit before I walked to Portage Place in search of a movie. With no matinee playing, I found an Arby's with a five roast beef sandwiches for five dollars deal so I took them up on that. I walked to another movie theater but again had no luck, so I went back to the depot and ate two sandwiches within its warming confines. I then visited the railroad displays at the Fork's Market. I walked through all the shops before returning to the depot to kill time. 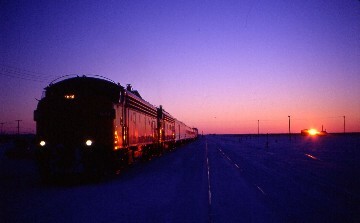 Oh yes, the outside temperature was a warm -17 degree C. I then got a great idea of upgrading to a sleeper on my return from Churchill and I got the last roommate for my two night journey back from the tundra along Hudson Bay. I made several phone calls back home to California before I did word fill-ins, read more of Timeline and listened to music. The time passed quickly until I boarded my next train. I boarded the Hudson Bay's first coach and since all the seats were in groups of four, I selected one in the middle of the car. The Lead Service Attendant came through and took my ticket before we departed so I set myself up for a night of sleep on this new route for me. We departed Winnipeg on time and as the train curved out of the station, I noticed that we were being pulled by two F-units. With their unique engine sounds and whistles, I fell right to sleep. I woke up occasionally to look for the Northern Lights but they were not to be seen. 12/15/1999 I woke up the next morning to a long pre sunrise twilight and changed into my winter clothes. I purchased a tea to go along with the cookies that I had bought back in Jasper and enjoyed both as I waited for the sun to rise which it did as we pulled into The Pas. I stepped off the Hudson Bay into a clear below freezing (-25 degree C) morning and placed my bags into a locker in the station. I went back outside to photograph the Hudson Bay and the cars used on thru Lynn Lake Mixed which was my next train to ride. I then walked around town finding a post office for more stamps before I located the Rupert House where I would be staying on my return. I hurried back to the warmth of the station, listened to Olivia Newton-John, read more of Timeline, retrieved my luggage and waited patiently for the boarding of my next train. Departure time came and went unlike the train. I feel like I am back in Juarez, Mexico waiting for the mixed train to Casa Grande but a blast of cold air when someone opened the door returned me to the reality of The Pas. The station is full of native Canadians who are all ready like me to board the train. The train pulled in and I boarded Via 5648 a 1944 ex CN (in CN paint no less), a Combine Coach Baggage which is the nonsmoking car on the train. The smoking car was Via 3248, a Combine Cafe Car. Most passengers boarded the smoking car. We then waited for our engines and 28 cars of freight to arrive. The train left The Pas at 12:30 PM, an hour and a half late and after we crossed the Saskatchewan River, the engineer opened up the throttle on the Hudson Bay Railway M-420 and a loud bang occurred with the engines losing power. We backed slowly into the yard at The Pas to perform an engine change which was done quickly. 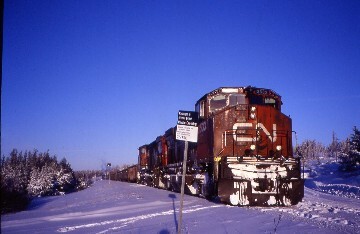 The conductor tells me that CN still owns the tracks from the south into The Pas and the Hudson Bay Railway operates all trackage to the north. The Lynn Lake Mix is operate by the HBRY for Via and is called an essential service since it goes into areas with no roads. We departed The Pas once again this time at 1:23 PM. We headed out of town and made our way up the Churchill Line as far as Flin Flon Jct. where we curved off giving me a great view of our train and headed out into the forest. Just before MP 9 we crossed the 54th parallel as posted on an adjacent highway sign. We passed the first of many frozen lakes as we made our way to our first stop at Cranberry Portage, a good size town for this part of Manitoba and has a train station still standing. Further north, we reached Sherritt Jct, where we left the Flin Flon Subdivision for the Sherridan Subdivision and its entire length of 184.6 miles to Lynn Lake. It was here also that we left the highway behind. The landscape changes after being flat since The Pas had now turned hilly as we neared Optic Lake. Just north of there our engineer saw someone flagging the train too late so the train had to reverse to pick up the passenger who went into the smoking car. The locals have taken no interest in me and the friendly train crew stopped by occasionally to keep me company. 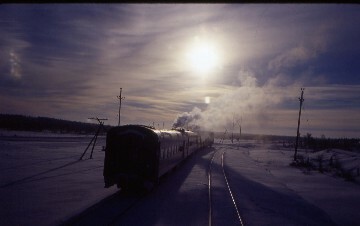 The sun had already set by 4:00 PM so the train continued north in the extended twilight period that leads into the long December night. The conductor stopped by to inform me that most of the passengers would be getting off at Pukatawagan. As the trip continued into the night, I finished my book, Timeline, at 7:49 PM CST. It was an excellent book teaching me more about the Middle Ages. We arrived in Pukatawagan where every passenger in my car detrained. As we sat there, I curled up to take a nap as our projected arrival time in Lynn Lake was 2:00 AM. Just as I had nodded off, a couple boarded my coach and were in a shouting match as they tried to carry on a conversation with each other. She has a check to cash but had left her ID at home so she would not be able to cash it at Lynn Lake. So after about ten minutes of heated discussion, she decided not to go and walked off the train with him following saying angry words at her. The brakeman came through saying "It is one freezing night. Ever been anyplace this cold before?" I responded with "Colorado with a minus fifty as a wind chill." "Well, Chris, I think you picked the coldest night of the year to visit Lynn Lake!" We both had a good hard laugh at that as tonight I knew that I would break the all time Chris Guenzler low temperature record. After we were on the move north for thirty minutes, frost was forming fast on the window sill and the inside temperature of the car dropped as the outside temperature drove further down. This caused me to add more layers of clothes to stay warm. 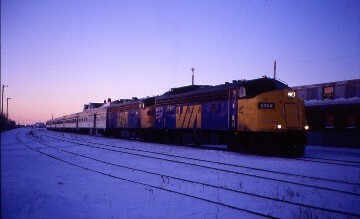 12/16/1999 Midnight came and went so I start another day of my life on a train. One nice feature of our train is that the roof of the smoking car is equipped with floodlights that make night time viewing possible. It provided a nice distraction of having something to see out of the window instead of absolute darkness. I ventured out on the rear platform for a minute of frozen star gazing. What an incredible clear sky as I could almost touch the stars as they looked that close. Back inside, I watched the trees pass, listened to music and stayed warm as we closed in on Lynn Lake. Prior to our arrival the crew called a taxi for me but the driver was home asleep so I will ride with the crew to their bunkhouse and then be taken to my hotel. I was told that we would get all the switching out of the way tonight. We spotted cars at several industries before we arrived in Lynn Lake at 2:25 AM. Everyone is unloaded and the train is plugged in for the night to keep the train from freezing up. We were told by the van driver that it was -42 degree C out and should drop a few more degrees by morning. After the van dropped the crew off at their quarters, it took me to the Lynn Lake Inc. Hotel where I had a room reserved. I got the key and headed across the street to the wrong building first before I found the right one. I carried my bags upstairs to an outside walkway and found room 60 at the far end of the building. Keep in mind I'm still outside in the -42 degree C (that is also -42 degree F), I opened the screen door, put the key in and after many tries the door would not open. Figuring that this could only be happening to me and keeping a Monty Python sense of humor about these events, I walked back down the stairs across the street to the lobby, rang the bell to get in and this time received two keys. Back across the street, up the stairs, try both keys, lose once more and repeat the returning process and I am back at the front desk. Get a new room assigned. You know where I went, tried the key, it worked and opened the door to the room. I had to then retrieve my bags from the complete opposite end of the outside hall before I took a nice hot waterfall shower. I made the mistake of turning off the cold water first so I got scolded thus teaching me an important lesson, "Get out before you turn off the water!" I went to bed thanking God for these experiences, my sobriety and life in general before I fell fast asleep. Later that morning after sleeping late, I had an excellent lumberjack size helping breakfast before I was vanned back to the train for my return to The Pas. Last night's low temperature was a new record of -42 degree C.
When the van arrived at the train, I put my bags in the vestibule of the Via 3248, and took off to the front end of the train for a picture. It was a sunny clear -25 degree C day. As I walked back by the engine, the engineer asked me if I wanted a cab ride down to Hone and I said "Yes, let me just store my bags and grab some film!" 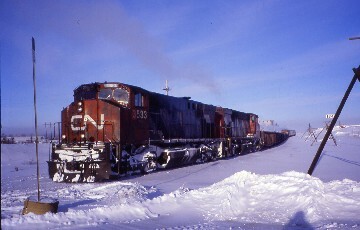 By the time I did that, the engine was backing down to the switch of the wye, so I climbed off at the switch, waited for the engine to come around before I climbed abroad the Hudson Bay Railway's 3533, a M-420W locomotive for the start of my return trip to The Pas. This was not my first cab ride on this type of locomotive as I rode in one on the Nacozari Trip down in Mexico. We pulled down, uncoupled and picked up ten gondola cars full of nickel ore for the plant at Flin Flon. 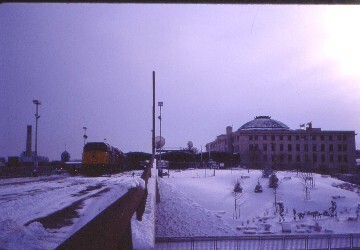 I went outside to get a picture of the train while the air line of the train charged, I left my gloves on the cab heater and when I grasped the railing to climb down my bare hand froze to it. I quickly pulled it off and did I learn an important lesson. Never go outside without your gloves on. I put my jacket sleeves over my hands and climbed down to take the picture. I climbed back up with my hands in the sleeves and opened the cab door the same way. Just as I walked in, the engineer was holding my gloves saying "Miss these did you!" I said "Yes, I surely did". He said "Do not feel bad. The first three times I climbed off the engine here in weather like this I did the same thing. We both laughed hard at that one. The picture by the way came out great. We headed south towards the afternoon sun which was at thirty degrees in the sky. The tracks twisted and turned their way across the hilly landscape. We are traveling through the Tiaga whose trees are so thin that they are not good for much of anything. Take that back, with billions of these trees they must produce a large amount of oxygen for our planet. Our engineer is very talented at handling this mixed train and we talk about derailments, excess speed on S curves, winter train operations, hockey, and of course Canada including the Quebec thing. It only took five days of being in Canada on this trip for that last subject to be brought up. We also talked about voting, something that Canadians do far better in numbers than Americans do back down in the States. As the train pulled into Hone, I thanked our engineer, climbed down, took a quick picture before waiting for the train to pull forward to pick me up. I climbed in though the combine's baggage door and took the seat where my baggage had been riding. I went up to the next car and brought a micro waved precooked hamburger which took care of lunch\dinner. The train crew runs a miniature cafe service with reasonable prices. It was not listed in the Via Timetable. The hamburger was extremely good. I put my headphones on and watched the countryside that we had passed last night in the dark now in full daylight. That's part of the magic of train travel. Late train north makes for a later start south and so I got to see most of the line in daylight plus enjoy it all with a cab ride followed by a great meal. I got to see the line through the hills, rocks and Tiaga trees all the way south to Pukatawagan where the car filled up and in the last of the twilight the train crossed the triple bridge crossing of the Churchill River. From here to The Pas, it was another night time trip this time with the cars light going from their usual brightness to total darkness to sub light then back and forth between all three light conditions. When it's dark, it is great because I can see out the window perfectly. When it was bright I can write and in sub light I can do both plus listen to music in all three with it being Supertramp Live in Paris in this case. I wished I had one of Amtrak's emergency glow sticks with me. Now when was the last time that I was on a train without any head end power besides this? Mexico with Anna on my last Copper Canyon Trip with Bananafish Tours. I wished that she could be sharing this adventure with me now. Oops, she hates cold temperatures and these are a far below cold. This whole situation gets my mind thinking and that is something that train can do for a person very well. As the lights fade into total darkness once more, I sure would not miss the days of wheel driven power when they are gone. Around 7:30 PM we came around a curve and by the trees along the tracks there was a huge bonfire lighting up the whole forest around it. The train stopped and our conductor went out to investigate. It was lit by two people who had been dropped off by a four wheel vehicle and had been waiting for us to show up. So the fire had two purposes: to signal the train crew and to keep the passengers warm and alive until we got there. If it would have been me, I would have roasted some hot dogs then had some smores as well as drunk Coca Cola. It would have been so easy to keep the coke ice cold. We continued in a basically southward direction with no landmarks or mileage markers visible. I was literally in the dark to our train's true location. It was not until we picked up two people and I saw the twin antennas that I knew that we had just left Sherridan. As we left I thanked God that I had bought plenty of music with me as these have been two of the longest train riding days of my life. Is this the slowest trip ever? The only other one that could even come close was the five miles of five miles per hour on the Eureka Southern in the Eel River Canyon in California. With that thought, we were three more hours away from The Pas. About an hour and a half later, we passed through Flin Flon Jct. before we arrived in Cranberry Portage where most of the passengers detrained. 12/17/1999 Midnight passed as the train set out a string of section cars (online workers living quarters) waiting for their next assignment. I have been on this stretch of railroad now for three calendar days. As we closed in on The Pas, the crew informed me that they were going to die on the law at 1:20 am and that a new crew would be waiting at a grade crossing at Prospector if all went right we should be in The Pas by 1:45 am. The crew change takes place and in no time we were moving again as our former crew had jumped into a Taxi cab for town while I took a 10.2 mile rail journey to The Pas. I was all packed up and ready to go but first we had to set out some cars at the plant outside of town before we arrived in The Pas at 2:16 am. I detrained, walked the five blocks quickly in a very strong wind chill breeze, talked my way into the Rupert House (they lock their doors at 2:00 AM), got my room, showered and hit the sheets for a very well deserved rest. A knock on the door came about 8:30 am, I turned on the cable TV to the Canadian Weather Channel and there was The Pas' current weather, a -17 degree C air with a -31 degree C wind chill factor. I showered, dressed and checked out of the Rupert House before I walked back down to the train station where I learned that my train would be here in ten minutes. As I sat and waited, I thought back to the last two days and the things that I accomplished by riding the Lynn Lake Mixed Train round trip while others ride the train one way and the bus the other even with a Canrail Pass. I met so many friendly and interesting people with a train crew who treated me special for just who I am. The days and nights were long but I survived them with pride. It was a once in a lifetime experience. I heard a horn which signaled the arrival and start of my next train journey with more new rail mileage to get. After the service manager swept the snow off the steps which there was a lot of it, I boarded my coach Via 8105 an ex CP Rail car. I stored my gear before I went to photograph the train. 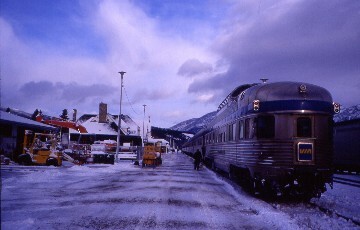 The front of the train has two F-units while on the rear behind the sleeper is Via's only other Combination Baggage Car 5649, the sister car to the one I rode on the Lynn Lake Mix which the crew dropped off at The Pas before we left town. I did not even feel cold out in the -17 degree C air as I guessed that the -42 degree C air in Lynn Lake adjusted my body to the cold. The service manager took my ticket and I walked back to Via 8417 (The Princess) Dinning Car for a breakfast of Pancakes and Bacon. Gone is the china of the Canadian replaced here with plastic ware but even without the china it was an excellent way to start the trip. As I finished eating, I glanced at the Dinner Menu planning what I would eat tonight. I returned to my seat listening to David (Bowie) Live and watched the countryside pass at a much greater rate than the last two days. It feels so good to be moving at a greater speed than 40 MPH. The 90 MPH of my San Diegans are a whole world away back home out in the California sun. We passed the industry where we dropped off the cars earlier this morning and saw that they had already been unloaded. It was trying to snow as we passed through Flin Flon Jct and the start of my new trackage of the trip. Further north the snow really came down and with the activities of the last few days catching up with me, I curled up in my seat and slept soundly for the next two hours. I awoke at Dunlop refreshed and alive looking out at a forest of Tiaga trees like I saw before I took the nap. 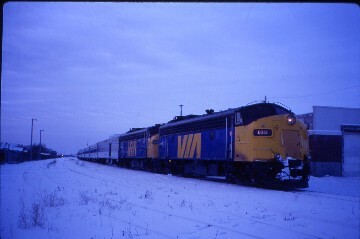 I continued with Bowie to Wabowden where after our station work was done we backed into a siding to let a southbound freight get by with HBYR engines 3543 and the 685 which was the power of our train to Lynn Lake before the motive power problems in The Pas. A small world, is it! Around MP 160 the Tiaga Trees took complete control of the landscape and the tri legged telegraph poles have almost sunk completely into the ground. It costs more trying to remove something here than just to let it sink into the earth where it came from in the first place. Maintenance crews have to contend with unstable track conditions which are the direct results of frost heaving and sinkholes that occur along the tracks. The permafrost can be discontinues which can also lead to problems. After the spring thaw, beavers dam up streams which flood the tracks and crews have to eliminate the dams that these creative animals build. It was a place where railroad building was done with a trial and error method. 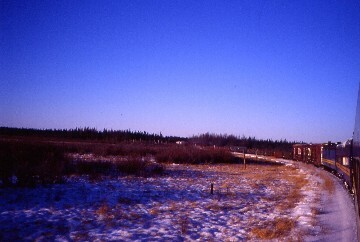 The permafrost caused many new building techniques to be invented. Track without a bed of ballast would sink straight into the earth if built directly on the ground. It's a totally different world than the one I live in back in Santa Ana, California, USA. Before Ticket Portage we passed another log reloading station. As the gentle snow fall returned, we were lined into the siding at Hockin to let our sister train by heading south. We pulled through the siding instead of backing up which surprised me. At Ticket Portage we picked up 30 passengers going to Thompson. This is the most passengers on the train so far this trip. The baggage man called them Thompson short hauls telling me I will have some company for a change. The train passed by the first of the Thermo Poles which were designed to keep the ground under the tracks frozen year round to avoid the summer maintenance headaches with the thawing of the earth from its winter permafrost conditions. 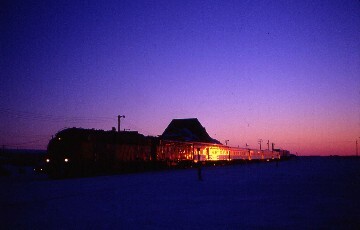 At Thompson Jct., we curved off of the Churchill line almost due north and headed up the branch line to the town of Thompson which we arrived at 5:15 PM for an hour and quarter layover. I had heard horror stories of the locals who rode the train from Thicket Portage and Thompson as well as on the Lynn Lake train. The Lynn Lake train was peaceful and quiet with the exception of one little kid coming into The Pas but I believe that was caused by the late hour train. On the Hudson Bay, the Thompson short hauls were more spirited as well as being louder. The kids were more or less out of control. At one point they were carrying each other on their shoulders until the service manager came through and stopped that. Later they were climbing over the back of the seats and swinging from the luggage racks. After expending all their energy, they settled down and the rest of the ride into Thompson was quiet. While the train was laying over in Thompson, the crew returned the interior of the train to Via's high standard of cleanness before the through passengers reboarded. While I was off the train in Thompson, I called home hearing my own voice on the answering machine and when I walked back to the all buttoned up train, the attendant would not let me in. The train left to go get some piggyback flats for Churchill since there are no roads leading there, with the train acting as a land bridge. So instead of being mad about being stuck outside, I made the best of it by walking the snow cleared platform for exercise. I walked a distance of twenty five yards and made thirty round trips for a total walk of 1500 yards in the minus -19 degree C air. When the train returned, I reboarded with the next group going back to Gillam. These passengers must be called Landing River short hauls. A good walk always gives me a good appetite so I headed straight to the Dining Car where I ordered the Pork Chops and had one of the best meals that I ever had on a train. We departed Thompson right on time as I finished my meal with the train retracing our route south to Thompson Jct. where we returned to the Ticket Subdivision of the Hudson Bay Railway to run to Gillam and then the Henchmer Subdivision that will take the train to Churchill sometime tomorrow morning. The passengers that are going to Landing River were just like the Thompson group with the exception of the older kids who were better behaved. The little ones did whatever they pleased or they cried when they did not get their way. A lady behind me is playing a hand game which is keeping her kids thoroughly amused. Another passenger is playing Tetris on a hand held video game with the volume up so loud everyone in the car can hear it so I turned up my UK Live all the way to drown them all out. These large groups of passengers had gone into Thompson to do Christmas shopping as the train is the safest and easiest way of getting into town this time of year. Once they detrained at Landing River, the train returned back to its quiet self and the VIA crew cleaned it up once more. That was until Gillam where an Ice Hockey Team from Churchill got on boarded making noise and waking everyone in the car up. As their leader got near me, I said "Oh no, not again." He then said, "There are people sleeping in here so let us move to the other car" which they did. One women though said out loud to anyone who would listen, "I paid to ride this train!" and when she left the car went back to its quiet night time state and everyone went back to sleep. When did I ever get on a train and made a point to wake everyone up? What would your answer be? The correct response would always be: "Never!" 12/18/1999 I slept off and on checking for the northern lights with my now usual results before I woke up twenty minutes out of Churchill and started to prepare for my arrival. I've dreamed of coming to Churchill for years after seeing the Revelation Video "To the Northern Lights" which showed a winter visit that made me want to come this time of year. The last few miles were in the long morning twilight period through the last of the Tiaga then out onto the Tundra near Hudson Bay. I have been waiting for this moment to put on the song by Jethro Tull called Tundra from the Under Wraps Album. I would not have to worry about leaving my snowshoes out in the Tundra because I did not bring any. We passed the wye used for turning the train before it returns to Winnipeg before passing the remains of the Canadian Army Base just south of town. Arriving by train in the Tundra was the one climatic zone in North America that the Aurora in Alaska could not take me to so I finally made it. 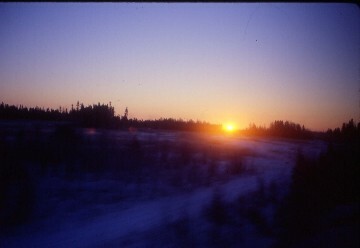 We arrived in Churchill at 9:05 AM just as the sun was rising on the southeastern horizon. I detrained, set my luggage in the waiting room, walked back outside to the front of the train, crossed the tracks and was rewarded with a picture of the Hudson Bay on one side and the rising sun on the other. I went back inside the depot and checked my bags in for the day in the stations baggage room. As I walked outside, on the wall of the station was a polar bear warning sign. I went back in to inquire and learned that the last of the Polar Bears had left town two days ago. The town was built on the bear's migration route so every year the bears pass through town on their way to the ice that forms out on Hudson Bay where they live off of seals and the like. They spend normally about a month's time in and around Churchill. The town has very strict rules about being outside when they are there and because of this polar attacks on man are in the zero range. This year through late November, a climatic control did not allow the ice to form on the bay because of its warming effects to the atmosphere. The bears arrived like they normally do and had an extended wait and the town was under Polar Bear Alert for almost twelve weeks hence the reason the sign was still up. I walked down the ice covered street to the Gypsy's Bakery for breakfast as recommended by the service manager. I called Long Beach and talk to my good friend Jeff Hartmann to see how he did on his final. He got an "A" on the final and a "B" on the midterm. I was really proud of him and all the effort that he puts in his studies. 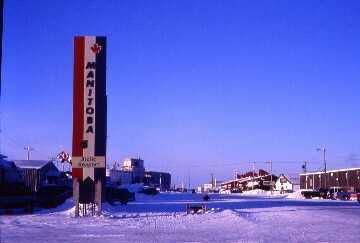 A couple gave me a ride (it's -25 degree C day) to the Tundra Motel which happened to be closed so I walked to the Churchill Motel and got a day room for $41.60c GST included for my visit until tonight's train to Winnipeg. Across the street was a trading post where I bought the post cards that I sent to people. I took a nice long hot shower followed by a nap for about three hours. I watched a Pittsburg/Kansas City football game and filled out twenty one post cards as Kansas City won (sorry Oakland). I walked back to the station for some afternoon pictures of the train and ran into a member of the train crew who suggested that I visit the Town Center. The sun set at 3:52 PM on the shortest daylight day of my life. I called my brother Bruce and Mrs. Angle that great science teacher that I work with. I walked down to the Town Center which is an impressive complex with library, hockey rink and a gym. I visited the Eskimo Museum next door followed by the Post Office in order to mail the post cards. I ate an early dinner at Gypsy Bakery prior to walking across the street to a Gift Shop for a T-shirt with Polar Bears, Northern Lights and Churchill all on it before I returned to the warmth of my hotel room. I called lifetime friend Bruce Fenton in Victor, Idaho with my guess where I am calling from question. I watched a Canadian News Station to see what was going on in the real world before I watched my first ever Hockey Night in Canada game. I called Christina Stewart who was having her house warming party in Dana Point that I would have attended had I not been here in Churchill. I watched Family Feud which I did not even know it was still on TV, Wheel of Fortune, Jeopardy and a Martial Law episode which was a Christmas Story and well done. The first three programs came from a BC TV station and Martial Law from Detroit. Is not satellite TV amazing. When the show was over, I packed up, covered my body up and headed out into the night's frigid air back to the train station. I retrieved my luggage from storage and waited for the southbound loading of the Hudson Bay around 9:40 PM. Click here for Page Two of this Trip.